As a huge National Public Radio nerd, I'm stupidly geeked about this. Via Twitter, Laura C. at NPR's Bryant Park Project NY radio show asked me to snap a photo when I voted yesterday. I sent her a few last night – today they're on the BPP blog. How chuffed am I? SO chuffed. Thanks again, Laura. You rock. p.s. 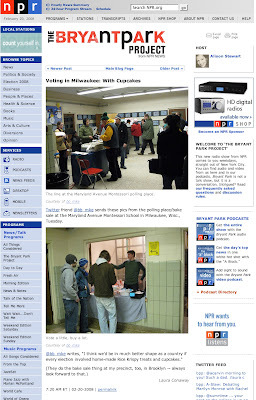 The rest of my voting pix, including a snap of the cupcakes, are here. They always have a bake sale at my voting place too! It's lovely! Way to go, BB! That's fab.